These free step stool plans will walk you through the simple woodworking project of building a wooden step stool all on your own. It's a basic project that takes very few materials and even less time. There are both one-step and two-step step stool plans here in both classic designs as well as more unique designs which besides being functional, will really add some style to your home. Take a look at all of them before deciding which one you're going to use. In all these free step stool plans, you'll find written building instructions, color photos, diagrams, and user tips on how to make sure your DIY project turns out to be a success. 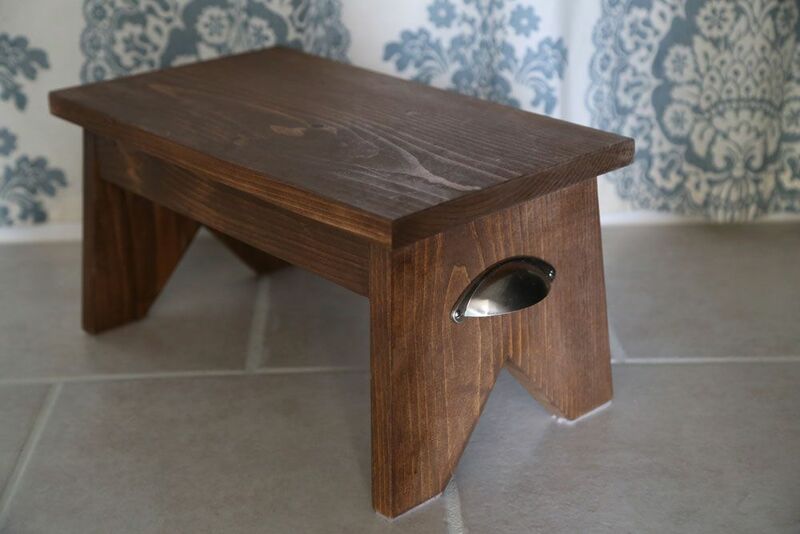 This step stool from Ana White is very easy to build. The stool is 16" wide, stands around 8" off the ground, and is just over 9" deep. Aside from cutting out the feet (which you could skip over), this step stool is one of the easier ones to build. The instructions are very clear and descriptive with illustrations. Here's a free plan for a simple step stool from Build Something. It has two steps and a straightforward design. Included in the free plan are a step-by-step building list, a tools list, a materials list, a parts/cut list, and extra tips. There are plenty of photos and diagrams to help you out. Her Tool Belt took the challenge of building something with just one board and she came up with this fabulous stepstool that would look great in any home. The one board along with some pocket screws, wood glue, and sandpaper will get this built in no time. More Like Home has lots of DIY projects, and most all of them, including this step stool plan, are easy to follow because they include color-coded illustrations to assist in building. This step stool is one of the easiest-to-build—and cheapest—stools in this whole list. It should cost just a few dollars to put together. I like this free step stool plan from Woodworking for Mere Mortals because there's a cutting guide you can print off to make the sides look exactly like the ones in the plan. In place of written instructions in a video showing how to build the step stool. Here's another step stool plan from Ana White. With two steps and a rugged feel, this vintage-style step stool stands a little taller off the ground at one foot. Ana White also has a similar two-step step stool with a different base design that's a foot tall that you can check out, plus a smaller one with built-in storage. The instructions in this step stool plan are very detailed, and the illustrations and cutting patterns are color-coded to help you along the way. This step stool doubles as a small toy box or another storage container. This means you can keep a few things in it and also use it as a step stool or a place to kick your feet up.​ It stands 10" from the ground with storage room for things as tall as 8.25". Check out the list of materials before the steps begin to make sure you have the necessary items to build this step stool. Popular Mechanics as this step stool plan that's a "step stool turned chair." The list of tools and supplies are listed in the plan as well as assembly instructions. There's a link in this plan to some more details on building the step stool, including notes, dimensions, and drawings, so be sure to check those out too. This step stool is super unique. It has three steps, as you can see in the picture, but if you closely you can also see the design on the floor and how each piece of the three steps can be moved freely along the rightmost rod. This makes for a spiral step stool, one unlike any of the others in this list. It may work perfectly for a narrow space that couldn't otherwise fit a 3-step step stool. Additionally, there's another step stool plan at Instructables that's much easier to build but is only one step. 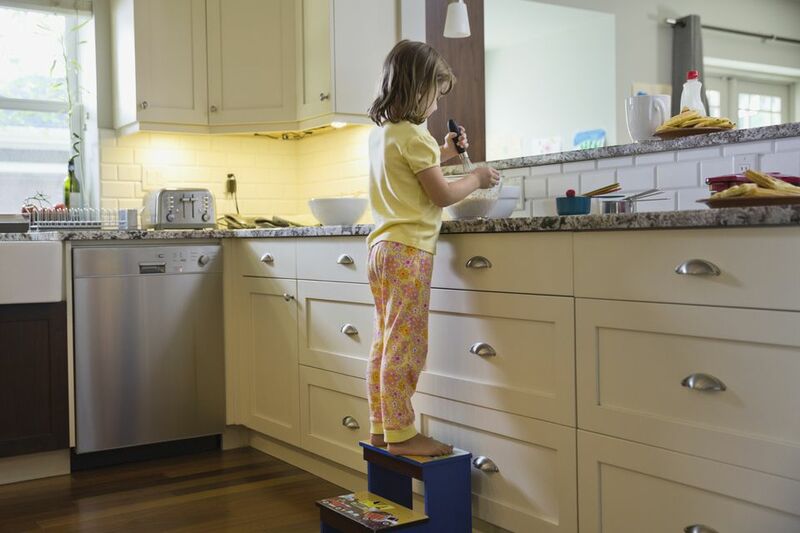 The step stool plan from MyOutdoorPlans is much like some of the other easier-to-build stools from this list because the instructions are clear and the pictures are very easy to follow. It should take less than a day to complete this project, and all the tools and materials you need are given to you before you start building.